VM makes it possible to have a network of different guests, an useful tool when studding network or server development. 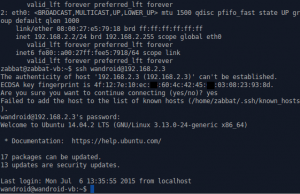 In this guide I show how to set up a network of guests. Step 3 – Where’s my internet? Sooner or later you want to connect to one of your guest OS. But they don’t have a physical network adapter and they are hidden behind your host. It’s actually not as tricky as it seem, virtualbox comes with its own DHCP server that you can configure and you can select different types of network adapters. Because we will use multiple guests I will refer them to guest A and guest B. For this guide both will be Xubuntu, like we set up previously, but any kind of Ubuntu clone should work. 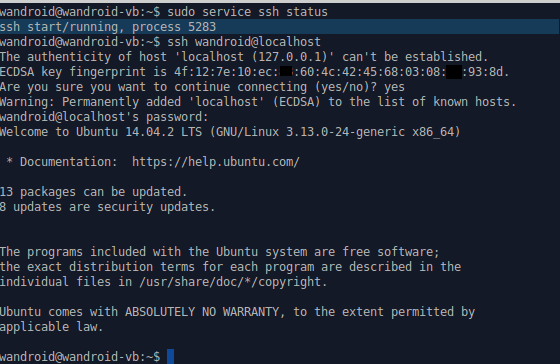 To test that we can reach other machines we will connect with ssh. Start guest A. 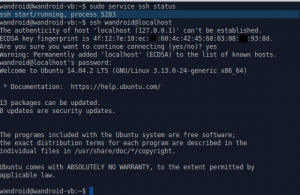 The ssh client is already installed, but we will have to install the ssh server that makes it possible to connect to your machine. There’s a lot of settings but what I normally do right after installation is to set “PermitRootLogin no” and change the port. Both these changes are for security reasons. We will change the port in another post so for now just change PermitRootLogin. That means the guest has IP 10.0.2.15 on eth0. The device id “eth0” will be important later when we use multiple network interfaces. Start guest B and keep A running. 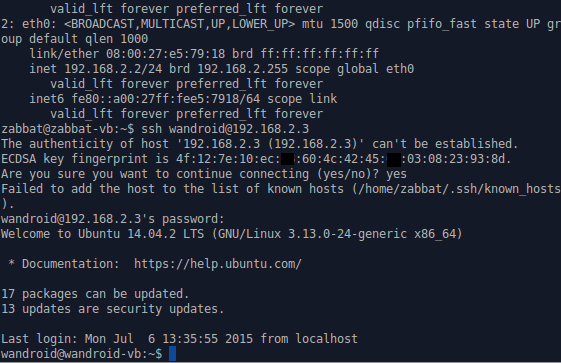 Since we won’t connect to guest B only from it, it’s not necessary to install the ssh-server. Hm, that’s not good ,they have same IP. The guests are also hidden from each other behind the host, so they’re given the same IP. The host doesn’t automatically route the traffic. What we need is a LAN where the guest can reach each other. We need a DHCP Server. A DHCP Server is responsible for giving devices on a network a valid IP address, normally your wireless router does this for you at home. —ip: This is the IP to your DHCP server, Don’t choose the same as for your host’s network. My host has 192.168.0.1 so I picked 192.168.3.1 (I like to use the same digit as my adapter for the second last number). –lowerip: Lowest IP a connected machine can have. I choose 192.168.3.2 (avoid ending with 0 or 1). –enable: This flag must be set or the DHCP Server won’t be used. See the manual for further information about dhcpserver. Turn off the machines so that you can modify them. 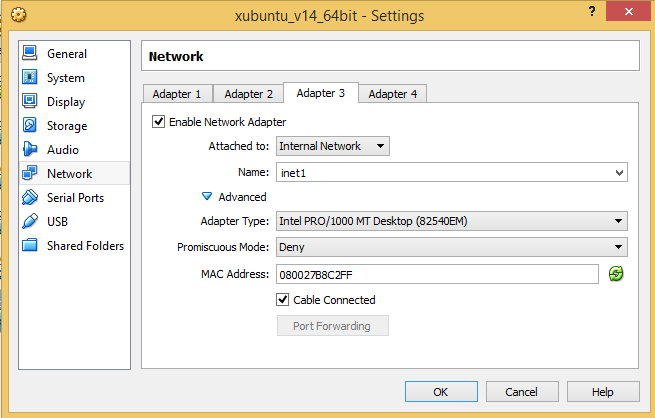 Select Guest A in virtualbox and go to Network. Adapter 1 shows attached to NAT, network address translation. In other words the adapter just translate the traffics destination to the guest. Disable it and select adapter 3. Change the attach to internal network to “inet-1”. Do the same for guest B. If you start a web browser you notice that you cannot connect to internet anymore. Since your adapter is only connected to LAN you can’t reach to the outside world anymore. The easiest fix for this is to add adapter 1 again. What we have done here is to plug one cable to the internet outlet and we one to our LAN router. Some times this is what we want, but it is not a very common setup. What we would like to do is to have our router connected to internet and then translating the addresses for all the machines in the LAN. This can be done by NAT Network. Open a console on your host. Disable adapter 1 and 3. 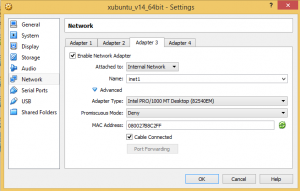 Enable Adapter 2 and select attached to NAT Network and select the network we just created. Start your guests again and make sure you can use internet. Then try to connect from B to A again by ssh. Now you can set up a network with several guests. It is much cheaper than buying several physical computers and requires less space and power. But what kind of Network should you choose? If you are playing around with a web server it is more secure to use the LAN solution, but it is also troublesome if you want to install software. If you only want to use internet some times you could do the LAN solution with a NAT adapter. You can at any time uncheck the “Cable connected” and you will go offline.